Banks were thought to be braced for the biggest financial hit, with lenders including Barclays, HSBC, Lloyds and Santander UK looking at losses of around £2billion. The firm's latest published debt figure is around £900million but sources said complex financing arrangements for subsidiaries means lenders could be facing losses of double that. Six companies – Carillion Plc, Carillion Construction, Carillion Services, Planned Maintenance Engineering, Carillion Integrated Services and Carillion Services 2006 – were all placed in liquidation, with PwC appointed to support the official receiver. PwC said there was no prospect of any return to shareholders, meaning heavy losses for those who had not cashed out amid hopes the stock could recover. prewin Dolphin, one of the UK's largest fund managers, had about 5 per cent meaning it would have lost about £41million since the disastrous trading update in July, assuming it bought all of its shares before then. Standard Life Investments and Kiltearn Partners, with a 4.96 per cent and 4.94 per cent stake respectively would have lost similar amount. Overall, the top ten shareholders as of yesterday would have lost about £579million since July, not including anything they had sold since that time. The fall-out also hammered businesses working with Carillion, with up to 30,000 estimated to be losing out on £1billion in unpaid bills. Rudi Klein, head of Britain's Specialist Engineering Contractors' Group, estimated Carillion had left a trail of £1.2billion in unpaid bills to thousands of small sub-contractors. He cited a Northern Irish engineering contractor owed £150,000 and a concrete frame manufacturer in north west England owed £2million. 'This can't be allowed to happen again,' he said. 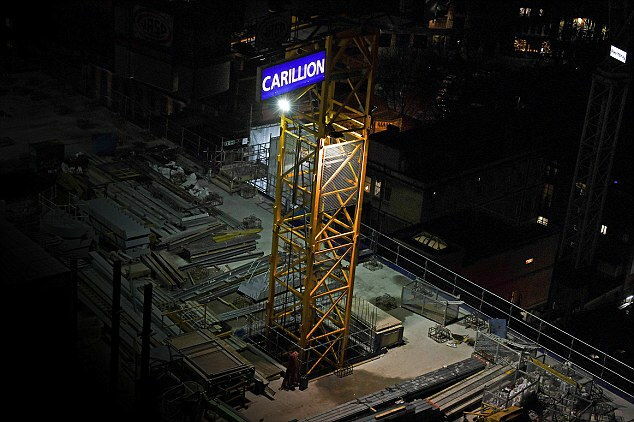 Carillion had about 5,000 direct small business suppliers, with fears growing last night that several could go bust in its wake. Big builders were among those badly hit. Balfour Beatty and Galliford Try were working with Carillion on the Aberdeen bypass, with Galliford saying the pair expected to have to stump up around £80m between them to finish the job. Balfour was also working with Carillion on the A14 in Cambridge and the M62 junction 20, and said it expected its own total hit from the collapse to be up to £45m.